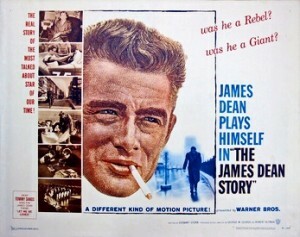 The James Dean Story is a 1957 American documentary. Released two years after Dean’s death, the Warner Bros. Pictures release chronicles his short life and career via black-and-white still photographs, interviews with the aunt and uncle who raised him, his paternal grandparents, a New York City cabdriver friend, and the owner of his favorite Los Angeles restaurant, and outtakes from East of Eden, footage of the opening night of Giant, and Dean’s ironic PSA for safe driving. Martin Gabel’s narration was written by Stewart Stern, who scripted Dean’s Rebel Without a Cause, and a directing credit was shared by Robert Altman and George W. George. The film’s theme song “Let Me Be Loved”, was written by Jay Livingston And Ray Evans and was sung by Tommy Sands in the film.